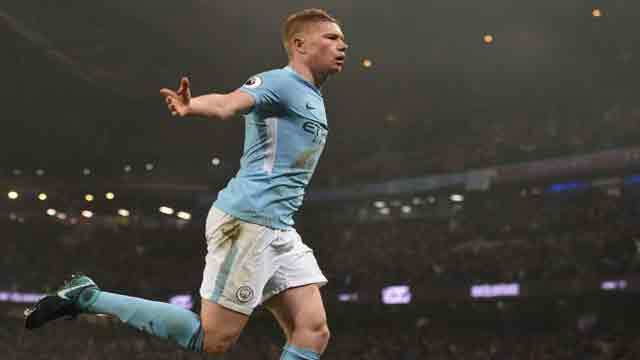 Dhaka, Dec 17 (Just News): Pep Guardiola said Kevin De Bruyne incarnated Manchester City's future after the Belgian's sublime display inspired his side to an emphatic 4-1 victory over Tottenham Hotspur. De Bruyne smashed in City's second goal on Saturday and had a hand in their third, scored by Raheem Sterling, who went on to complete a brace as City registered a record-extending 16th successive Premier League win. De Bruyne's hurtful passing repeatedly tore holes in the Spurs defence and Guardiola said that ability on the ball, allied to his exemplary work-rate, made him a figurehead for the club's young players. "Kevin is one of the most talented players and you see how he runs without the ball," said the City manager. "You cannot imagine how good he plays with the ball, but he runs like a player in the Conference (semi-professional) league. "It's a good example for the young players, for our academy, for Phil Foden, for Brahim (Diaz). They know how good Kevin De Bruyne is. And when they see how he runs and he fights without the ball, that is the best example. "He helps us to be a better club, a better institution for the future. Because that is what we want to do. His performance today, I have no words." The one-sided win at a misty Etihad Stadium gave City a provisional 14-point lead at the top of the table, ahead of second-place Manchester United's trip to West Bromwich Albion on Sunday. Guardiola has matched his best winning run with Barcelona from their all-conquering 2010-11 season and stands three wins short of his own record for Europe's five major leagues, which he set at Bayern Munich in 2013-14. "Of course I'm proud," said Guardiola. "I don't want to be humble right now. I'm proud with my staff to achieve that with three teams, every day being there. We work a lot and the players know that. "And of course that's happened because I was with three amazing clubs: Barcelona, Bayern Munich and this one. All three clubs supported me, all the decisions we believe in and they provide me with outstanding players. "Without good players and the club supporting your ideas, it's impossible to achieve this kind of thing."